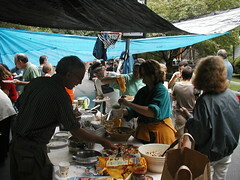 Food table under tarp. More photos here. The Maryland September 12 primary is a particularly overwhelming election in my town, with eighteen(!) Democratic Senate candidates, seven state assembly district candidates, thirteen Democratic county council at large candidates, and scores of other races as well. Some of my neighbors (Suzanna, Peter, Jim, and Jane) and my wife and I decided we’d weren’t going to risk wondering “who’s that?” in the ballot booth, and would get our neighbors’ help in figuring out the upcoming election. So we flyered our immediate neighborhood with an announcement for a “Politics Potluck”, to be held Labor Day afternoon on a cul-de-sac near our house. Neighbors were invited to bring dishes and their political knowledge — takes on issues, candidates, and controversies — to share with everyone else. Unfortunately, it drizzled. Fortunately, that didn’t stop us. We just strung a bunch of tarps from trees, bushes, and a basketball goal, and proceeded as planned. I think it was a big success. A couple of us spoke about races and/or issues, but the main thing was that there was a lot of discussion, both in small groups and then as a whole, with people clarifying points about candidates, recounting telling anecdotes, and generally participating in a pretty good discussion. I’ve come away feeling like I have a much better handle on the Senate race and county council races in particular, and I think other people learned a lot as well. I also met quite a few neighbors I hadn’t really met before — I can be a terrible stay-at-home. Names emerging from the fog of county politics for me were Duchy Trachtenberg (quoted to the effect “you can’t build your way out of traffic problems”) and Mark Elrich; in the delegate race, Lucinda Lessley got mentions by several people besides me, and one issue about Heather Mizeur got cleared up, at least to my satisfaction: her move to a new house was not done expecting to lose a council seat as a result. * Mfume and Cardin both had defenders and detractors. I’d gladly vote for either one over Steele. The Washington Post’s Local Elections 2006 puts Montgomery County side by side with other Maryland counties. The result is more condensed than the next two items, so it’s a good way to start, but might not be the best item to choose by itself. Statewide races are handled separately, with Senate, House, State Senate, and State House listings. Takoma Voice Voter’s Guide 2006 — the Voice asked questions of each candidate and publishes the answers here. There are also links to online broadcasts of the 7/20 Raskin-Ruben debate, the 6/15 District 20 delegates forum, and the District 5 Ervin-Riemer forum. ICC scorecard by MICC; unfortunately, it’s old (ca. 2002-4?) so many current candidates aren’t included. ATTORNEY GENERAL: Mr. Gansler’s Vision – pro-Gansler op-ed, Washington Post; Attorney General – pro-Simms op-ed, Baltimore Sun. COUNTY EXECUTIVE: Fundraising skills a blessing and a burden, Is Leggett just too likable?— Steve Silverman and Ike Leggett profiles, Washington Post. OTHERS: Washington Post profiles on Josh Rales, Allan Lichtman; Dennis Rasmussen‘s web site. Lichtman’s Letter from the Baltimore County Jail may suffer from an overdrawn title, but his points about being excluded from a publicly funded debate are worth considering. See also HotLine’s Who Judges “Significant” Candidates? and segments on WAMU’s Kojo Nnamde Show on 9/6 and 9/7. This resource list may be updated periodically over the next week. District 20 candidates on Fair Share Health Care: Murray, Klein, Lessley, Nixon, Raskin, and Ruben respond to my question about what the legislature should do next after a court decision striking down this good law. Raskin, Ruben, and “real Democrats”: about cases Raskin worked on, and Ruben’s charge he therefore wasn’t a “real” Democrat. …Nor was there anyone—including other members of the Council—who thought it would bar her from finishing her term. It was the city attorney who reviewed the charter and found that Heather had to relenquish her seat. So she gave up the title, but not the work. Those of us who were there watched Heather bend over backwards to finish every shred of Council business on her plate. She trained her replacement, continued to work on a number of issues with the County, and never once missed a meeting…even after she had been stripped of her title. UPDATE, EDIT, 9/5: Reorganized resource list news items by theme, added links (thanks Suzanna, Jim); added brief descriptions of my own posts. UPDATE, 9/5: Welcome, PEN list! Your comments and resource suggestions are very welcome, use the [#] comment[s] link below. UPDATE, 9/6: Links to additional Senate candidates and debate controversy added. UPDATE, 9/8: ICC scorecard added, although it’s old. Thanks to PEN list commenter Greg Smith for pointing out that the ACT survey ignores the ICC issue — a weakness, since the ICC may well drain away funds needed for the Purple Line. The trial court found that the Maryland law was preempted by ERISA because it effectively forced covered employers to modify their health benefits offerings in order to comply with the law. No, Fair Share Health Care did not force or even “effectively” force employers to do any such thing. It may well have encouraged that, but it did not require it. Under Fair Share Health Care, large Maryland employers had (or will have, if the RILA v. Fielder ruling is overturned), the perfect and attractive right to pay the shortfall between their actual health benefits and 8% of payroll into a state Medicaid fund, instead of increasing health benefits. That’s what’s called a choice, not a requirement; Wal-Mart could have kept its (pathetic) national health benefits package untouched, and spent 20 seconds cutting a check to the state Medicaid fund — advantage: simplicity, and whatever pleasure there is to be had in having a “significant percentage of associates and their children on public assistance,” to quote Susan Chambers, Wal-Mart’s Executive Vice President for Benefits. ** Or it could have increased health benefits, either nationally or within Maryland — advantage: attracting/keeping workers. Now I’m trying to plow through ERISA to see if I can figure out that legislation. So far, at least, I see nothing in it preventing states from providing incentives to companies to improve their health plans. If it does, it’s a stupid law. If it doesn’t, Judge Motz is a stupid judge. ** As State Senator Ida Ruben quite rightly points out. In particular, Ms. Chambers revealed that fully 27% of Wal-Mart associate children were on Medicaid. By arithmetic, another 19% were altogether uninsured. As you probably know, a federal judge overturned Maryland’s Fair Share Health Care (FSHC) Act last week. (I posted an item about this decision as “RILA v. Fielder strikes down Fair Share Health Care.”) Colloquially if inaccurately referred to as the “Wal-Mart bill,” FSHC required companies with over 10,000 employees to pay an amount equal to at least 8% of payroll to health benefits, or pay the balance into a state Medicaid fund. As I understand the ruling, the judge found this to be incompatible with the federal Employment Retirement Income Security Act (ERISA), but not a violation of the principle of equal protection for Wal-Mart vs. other companies. The decision will be appealed, but the prospects for success are uncertain. Assuming the RILA v. Fielder decision stands, what specific legislative steps do you support — if any — to pass a FSHC or similar measure that would withstand judicial scrutiny? By “similar”, I mean measures that address the needs of low-income wage earners with inadequate health care benefits, and/or the “free rider” problem of companies like Wal-Mart which — despite being highly profitable — essentially rely on state Medicaid systems to provide health care for their employees. I then discussed suggested word limits and formatting,* and asked for responses by this evening. Here are the Assembly and Senate candidate responses I received by this evening, in the order I received them. As you are aware, I was a strong advocate and voted for the Fair Share Health Care bill and view it as another step toward providing the Maryland workforce the rights and benefits they so richly deserve. I wish this were a problem for which I could give you a quick answer. Unfortunately this is a very complex issue which I do intend on addressing upon my return to Annapolis. The task is to craft legislation that will promote certain behaviors in reference to provision of healthcare by prohibiting or at a minimum removing economic incentive to do otherwise. Given the time required to adequately research and draft such a proposal, I do not have the time during this campaign for re-election. It is my understanding that the Wal Mart bill was struck down because it was found to be in violation of the Employee Retirement Income Security Act (ERISA), which essentially creates a federal statute to occupy the regulation of health and benefit plans in order to ensure that firms that employ people in multiple states can maintain a standard, nationwide package of benefits. I supported the aim of the Wal Mart bill which was to require that Wal Mart either provide health insurance to its employees or pay the State to provide the benefits that many employees obtained through State programs. If it would be possible to craft a bill that meets these objectives without violating the provisions of ERISA, I would support it. The better way to avoid the problems faced by the Wal Mart bill, however, and to ensure that all Marylanders have access to health care, is to create a system in our State that provides universal care or coverage. While such a system may be a single payer system or it may be a system such as was adopted in Massachusetts that requires all citizens to carry health insurance (and subsidizes coverage for those who cannot afford it), I believe it is shameful that some 700,000 Marylanders lack health insurance. A state with the resources that are available to Maryland can provide universal coverage if such coverage is made a top Statewide priority; if elected, I will work to make universal care this kind of priority. I supported the Wal-Mart bill, and I am sorry that it was struck down. But I thought of it as a stepping stone, not a solution to the health care crisis in Maryland. Since it only applied to employers who have over 10,000 employees, few residents in Maryland would have been affected. I want legislation which will provide universal coverage to all residents, modeled after the bill which passed in Massachusetts this year. Uninsured residents who can afford to buy insurance must buy it or face tax penalties. Businesses with more than ten workers must provide insurance or they will be fined. People below the federal poverty level will be provided with health insurance, without paying premiums or deductibles. Lower income people will be able to buy subsidized policies. The Massachusetts plan reduces the cost of health insurance for people who are already insured. Having fewer people without insurance will lower costs for employers. Adding healthy people, who use less health care, will keep deductibles and premiums down. The cost of health care is too expensive and it getting worse. Massachusetts legislators have shown that providing health insurance to the uninsured is possible. Since this is a new plan, it will probably undergo several changes before it works for everyone. But it does what the Wal-Mart bill failed to do. It comes close to providing universal health care, it makes most businesses responsible for covering their employees, and it offers hope that the broken health care system can be fixed. Background: The federal district court in Maryland struck down the Fair Share Act (Wal-Mart bill) because the law was clearly preempted by the federal Employee Retirement Income Security Act of 1974 (ERISA), which was designed to preempt state regulation of benefit plans. 1. Support a union organizing drive at Wal-Mart and other big companies to give the workers leverage to negotiate for better health benefits. 2. Pass a comprehensive, statewide universal health insurance plan, which will, in any case, be far superior to the Wal-Mart bill. After all, the Wal-Mart bill did not get health coverage for any of the 800,000 uninsured people in the state and arbitrarily fixed an 8% health spending share (why not 9%, 12% or 7.8%?) for these big companies. Judge Motz observed that the recently passed Massachusetts universal health plan, in contrast, did not conflict with ERISA because it “addresses health care issues comprehensively and in a manner that arguably has only incidental effects upon ERISA plans.” It is clear now that we need creative and legally-expert new leadership to make universal health care for Maryland a priority and a reality. I am hopeful that the Attorney General’s appeal of Judge Motz’s decision on the Fair Share Health Care Act will be overturned. If however, the appeal is unsuccessful, then I will work closely with the Attorney General on constitutionally acceptable legislation and I will introduce such legislation in the next Session. As a nation and as a state must do more to ensure that all of our citizens have access to affordable health care. It is critical that large corporations do their fair share for their employees. This year I supported legislation that created the Joint Legislative Task Force on Universal Access to Quality and Affordable Health Care. This Task Force will examine what Maryland can and should be doing to reform health care. Recently Massachusetts voted to approve legislation that will extend health care coverage to thousands of residents. As President Pro Tem of the Senate, ensuring that Maryland residents have the best possible healthcare is one of my top priorities. I will continue to work with my colleagues to find innovative solutions for our families. I sincerely thank all these candidates for their responses, and for being willing to discuss this issue in this format. I’ll add any additional candidate responses through Wednesday evening in an “UPDATE” section below, and thank them in advance as well. All candidates, their supporters, and everyone else can also leave comments by clicking the “[#] comment[s]” link at the bottom of this post. The Washington Post’s Matthew Mosk and Yian Q. Mui report (‘Wal-Mart Law’ in Md. Rejected By Court) that federal district judge J. Frederick Motz has struck down the Fair Share Health Care bill passed earlier this year, ruling it conflicts with a federal law setting national guidelines for employee benefits. The Fair Share bill required Maryland companies with over 10,000 employees to pay a minimum of 8% of payroll to health care benefits, or make up the difference with payments to a state Medicaid fund. Maryland lawmakers had been relying on an advisory opinion signed by Attorney General J. Joseph Curran Jr. (D) that listed a series of recent Supreme Court opinions, which, he argued, gave Maryland the latitude to impose the restrictions on Wal-Mart. Motz, however, said his reading of the cases was different. “My finding that the Act is preempted is in accordance with long established Supreme Court law that state laws which impose employee health or welfare mandates on employers are invalid,” the judge wrote. A short description of the statutes involved in Travelers, DeBuono, and Dillingham is sufficient to demonstrate that they lie at the periphery of ERISA analysis, not (as does the Fair Share Act) at its core. … so that he believes these Travelers etc. rulings do not open the way for states to be health policy “laboratories of democracy” regarding health benefits policy. Some of Motz’s arguments appear odd to me; for example, he seems to argue at length that the bill is either a tax or a fee (I think he settles on regulatory fee) — but soon thereafter asserts that “the General Assembly neither intended nor contemplated that Act would raise any revenue for the State” (since it was assumed companies would prefer to raise their health care expenditures to the 8% threshold). I hope lawyers such as Nathan Newman or publius will illuminate these arguments better than I can. It is quite clear to me that the intent of this legislation was to demand action by all large, private-sector employers in our State to develop or maintain health benefits’ programs for as many employees as possible. There are many chapters left in the legal battle; we will prevail because this legislation is both legally and morally sound. …unless there is a reason to “infer antipathy” from the targeting of a particular group or person, “[t]he Constitution presumes that . . . even improvident decisions will eventually be rectified by the democratic process and that judicial intervention is generally unwarranted no matter how unwisely we may think a political branch has acted.” … It is only in cases involving politically vulnerable groups that the Supreme Court has appeared to rely, at least in part, on legislative antipathy when invalidating a law under the rational basis test. But beyond that silver lining — such as it is — this is obviously a setback for the Fair Share idea, and one I hope is overturned as soon as possible. UPDATE, 7/20: a Progressive States Network bulletin comments that the Fair Share defeat may well be reversed, and in any event has little to no bearing on other approaches to the Wal-Mart issue, e.g., prevailing wage or “big box” laws. The article makes the same point I do about “singling out” not being grounds for overturning the law. Thanks, eRobin! EDIT, 7/29: New ERISA link directly to the statute’s language, rather than to a DOL overview. In its U.S. District Court suit, the Retail Industry Leaders Association claims the law violates the Employee Retirement Income Security Act, or ERISA, a 1974 federal law that leaves all regulation of health benefits to Congress. Tallman adds that RILA is also claiming that the Maryland law violates the equal protection clause of the U.S. Constitution because it allegedly singles out one company (Wal-Mart) for arbitrary treatment. A 1995 Supreme Court ruling explicitly gave states more discretion in this policy area vis-a-vis ERISA, as long as specific benefits weren’t prescribed. Maryland’s grasping for Wal-Mart’s revenue opens a new chapter in the degeneracy of state governments that are eager to spend more money than they have the nerve to collect straightforwardly in taxes. Fortunately, as labor unions and allied rent-seekers in 30 or so other states contemplate mimicking Maryland, Wal-Mart can contemplate an advantage of federalism. States engage in “entrepreneurial federalism,” competing to be especially attractive to businesses. A Wal-Mart distribution center, creating at least 800 jobs, that has been planned for Maryland could be located instead in more hospitable Delaware. That’s right — you don’t want to get into a rent-seeking contest with those guys! Were it the case that the Wal-Mart workers showing up on Medicaid client lists were seeking, say, cosmetic surgery or crystal therapy, Will might have a bit of a point. Even though by strict free marketeer standards, even such frivolities cannot be gainsaid those who desire them, Wal-Mart might rightly protest that they shouldn’t have to foot the bill. If, on the other hand, those workers or their family members were seeking medical care that will enable them to work productively again, then Wal-Mart has been getting quite a good deal compared to the rest of the working world. While again, by strict “greed is good” standards, we cannot begrudge the worthy folk of Bentonville a good cry as their free ride comes to an end, neither can we quite hold it to be “shoplifting” by the Maryland legislature when they essentially require some co-payment for services rendered. Think of the 10,000 employees requirement as a “means test,” and think of throwing a “welfare queen” off the dole, and perhaps we’ve reformulated things more to Mr. Will’s liking. Morning News reports that Bentonville is forging ahead with creation of a giant (2.8-square-mile) Tax Increment Finance District so that school taxes can be siphoned off to provide infrastructure to serve such areas as the Wal-Mart world headquarters, a world-class art museum being built with Walton money and land Wal-Mart has acquired for future development. Blight fighters at work, subsidized by taxpayers all over Arkansas. Nationwide, local governments have shoveled Wal-Mart over $1 billion in public money, according to a 2004 report from Good Jobs First. If poor, blighted Bentonville knows what it must do to stay in its master’s good graces, we must not second-guess that decision. But proud Maryland is not yet so far gone, nor may she ever be. And, as Will points out, there may be be more states like her in in the months ahead — lawmakers in 30 states are reportedly preparing legislation similar to Maryland’s. “Shoplifting as Governance”? Hardly. Rather, the days of “Freeloading as Business Model” may be drawing to a close. The Washington Post’s headline tonight is still off by one — it’s not just the “Md. Senate Overrides Veto on ‘Wal-Mart Bill‘, but the House as well. By 30-17 and 88-50 votes, respectively, Governor Bob Ehrlich’s veto of the Fair Share Health Care bill was overridden by the Maryland legislature. The law calls for Maryland companies with over 10,000 employees to either pay 8% of payroll to health benefits, or make up the difference with payments to a state Medicaid fund. This partly recompenses the state for the costs all too often shunted to state health care systems by low-wage, low health benefits companies like Wal-Mart. The bill prompted frantic lobbying in recent weeks, with unions and health care advocates airing radio and television ads and Wal-Mart running full-page ads in major newspapers. The company also bulked up its lobbying corps in Annapolis, hiring at least 12 lobbyists, whom [Senator] Pinsky derisively called the Dirty Dozen during yesterday’s debate. The Annapolis press corps was swollen with members of the national media, and immediately after the House vote, [House speaker Michael] Busch was whisked outside the State House for a national television interview. The whoops and cheers of advocates echoed in the vast hallway outside the House chamber. Union members and their lobbyists hugged lawmakers and posed for photos, giving a thumbs-up, some with tears in their eyes. “We prevailed. Yes!” said an exuberant Del. Veronica L. Turner (D-Prince George’s). Seizing on momentum from the Maryland bill, lawmakers plan to introduce similar legislation in Connecticut, Kansas, Florida, Colorado and Tennessee, among other states, according to A.F.L.-C.I.O. leaders. (AFL-CIO link added). The bills elsewhere will propose broadly similar provisions to the legislation passed in Maryland. Meanwhile, a big “Well done!” to the Maryland Democratic Party for seeing this fight through and winning it. They had a lot of support, but it was Maryland’s Democratic senators and delegates who had to go ahead and vote for this. Let them know you appreciate it. EDIT, 1/13: Americans for Health Care and legislative history links added (click MD flag for MD Senate leg. history and link to MD House).